Before heading out to Hawaii I checked out Trip Advisor and Yelp. I always try to check out and research restaurants and points of interests before I travel. Then there was Ted’s Bakery. We were told about this place from Erika, she was our Enterprise (car rental) rep. She was awesome, and gave us amazing tips and was very helpful. She said they had amazing pies and when we took our day trip to the North Shore we should def make a stop..so we did. It was a little hole in the wall place and it did not look like your typical bakery. I chose 2 individual pies from the refrigerator. Erika raved about the Chocolate Haupia pie and the Cherry pie. 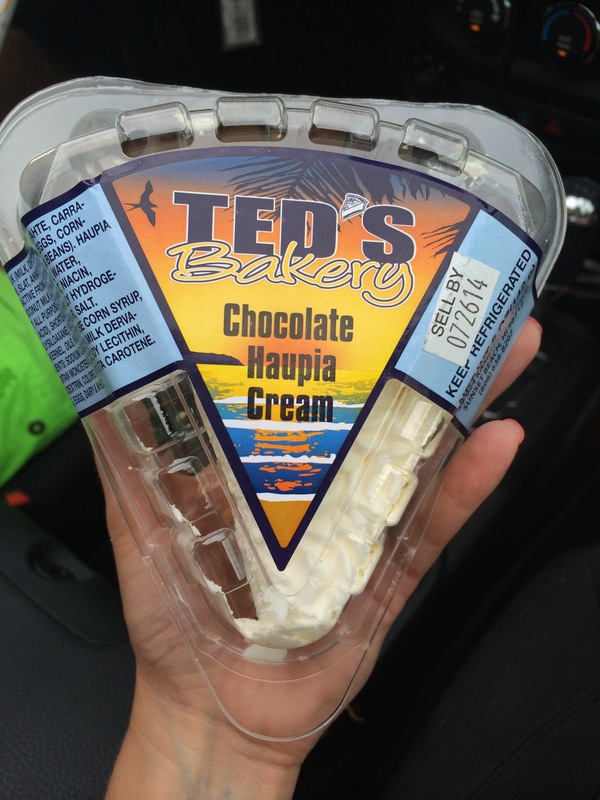 But, I’m not a fan of cherries so I bought The Chocolate Haupia Cream Pie and Strawberry Guava Cream Pie. It was amazing. I am still kicking myself for not buying more but we stopped there after we ate Garlic Shrimp and rice from Giovanni’s food truck so we were stuffed at the moment we stopped in. Which brings me to the Shrimp Trucks. Erika from Enterprise (car rental) along with a few other natives told us about Giovanni’s Shrimp truck that specializes in Garlic Shrimp. We were told it was the most popular, so when we drove out to the North Shore we stopped there to eat lunch and see what the hype was. There was no line but I read that it can get pretty busy with very long lines. My husband was a big fan. I really wasn’t to thrilled about the shrimp not being peeled and the little legs freaked me out. I was told that it is supposed to be more flavorful. However, I wasn’t into it (I was making a mess)and after attempting to eat it I gave up and gave the rest to my husband. (my husband thought I was nuts). However, I am not a big seafood person. The rice that came with the garlic sauce was delicious. 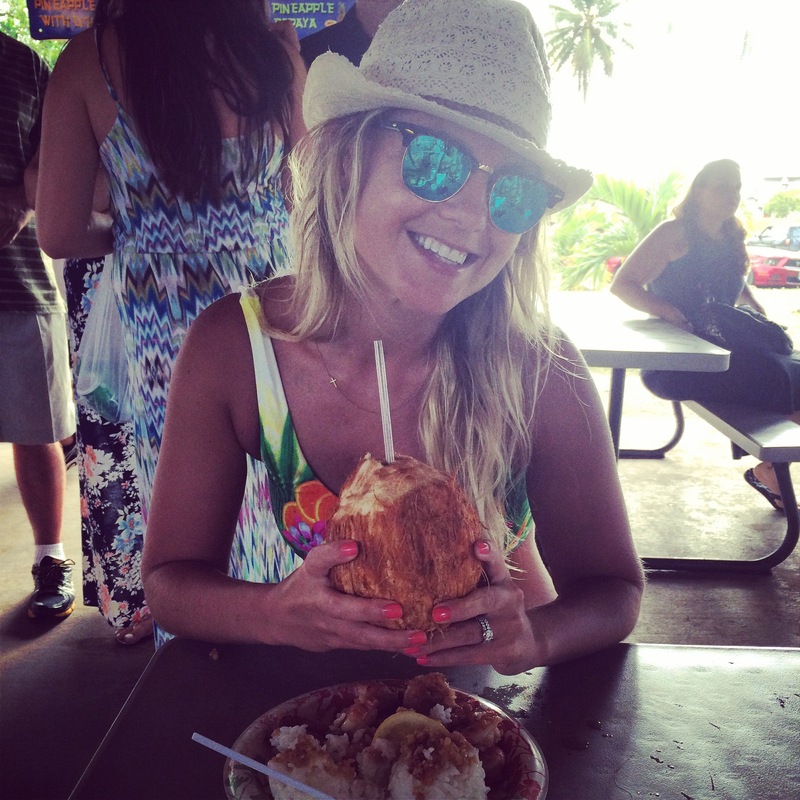 I also drank a fresh coconut there from a truck. 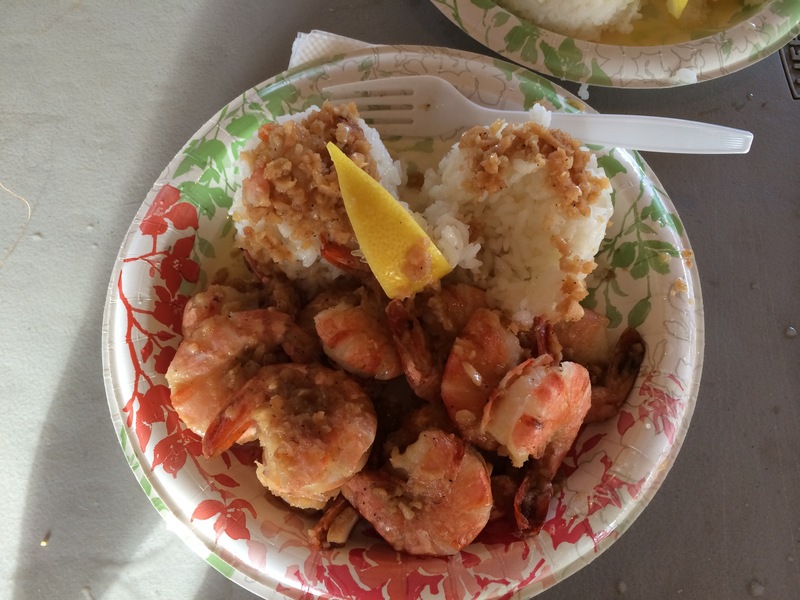 I personally preferred the garlic shrimp from Gilligan’s Beach Shack Shrimp Truck which was conveniently located right on Waikiki Beach, a very close walk from where were staying. There was rarely a line and everything I ate there was awesome. We had lunch there several times on our trip. Their prices were very reasonable and food was delicious. They have garlic shrimp, coconut shrimp, tacos, fish, teriyaki steak bites and it comes with their deliciously seasoned French fries.. so good(I scraped the plate every time!) It is also right next to where they filmed Gilligan’s Island. Thai Food!! 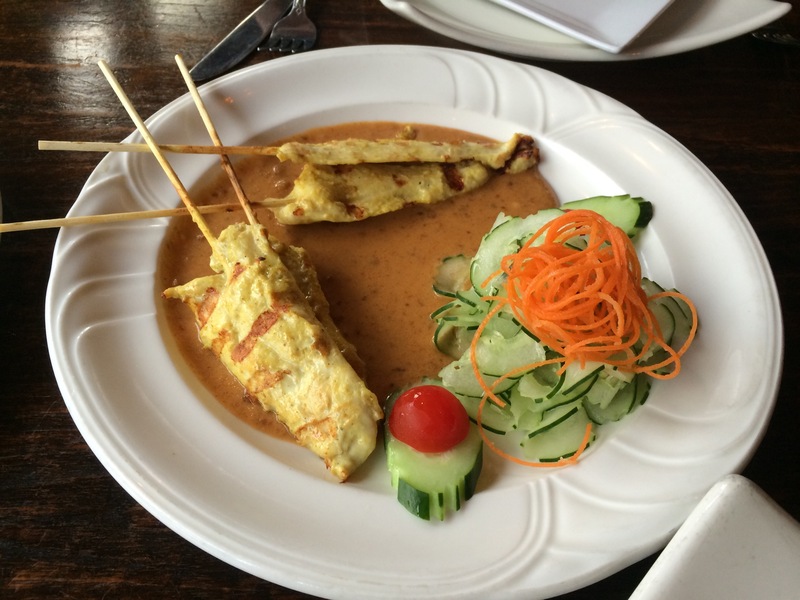 I am such a big fan of Thai Food! 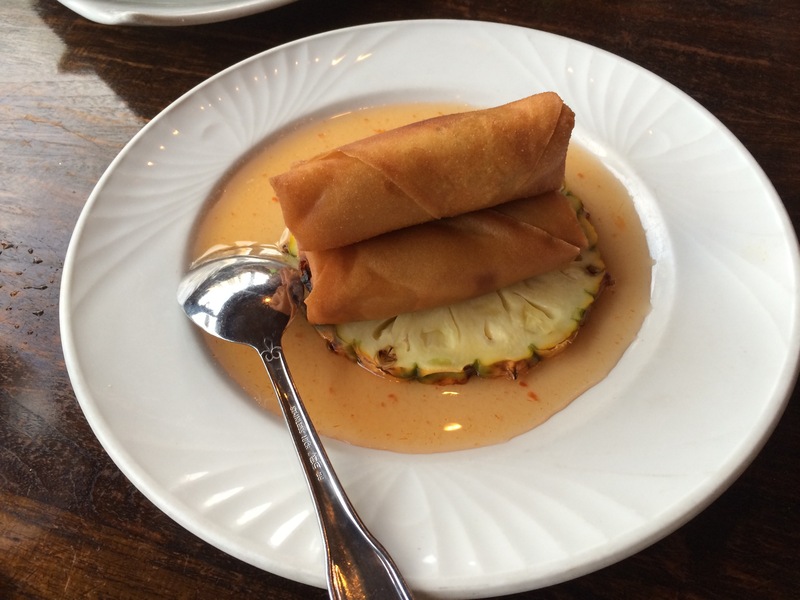 My husband used to work in a Thai restaurant back in the day so he was the one who introduced me to all the yummy dishes. (Pad Thai, Laad Na, Pad See Ew, sate…) They had several Thai Restaurants in the area to choose from. We found Siam Square when I was looking up Thai Restaurants in Honolulu. It was so good we took the long walk from our hotel twice to eat there. It is a pretty busy place. The second time we went we had to wait a while to be seated. However, they made up for it when the food arrived and it was well worth the wait. We ordered spring rolls and calamari for appetizers and Laad Na, Pad See Ew, and Chicken Fried Rice for our entrees. Some of the best Thai food I have ever had. Loco Moco is a Hawaiian dish that I tried when eating at Tropics Restaurant located at our hotel. I wanted to dry something different. 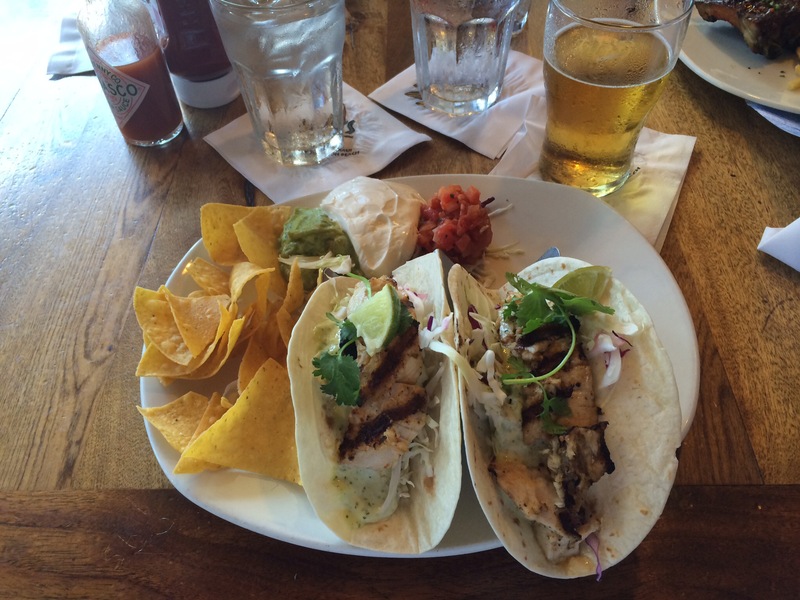 Tropics is a beach front restaurant and they have live music that’s what drew me to it. 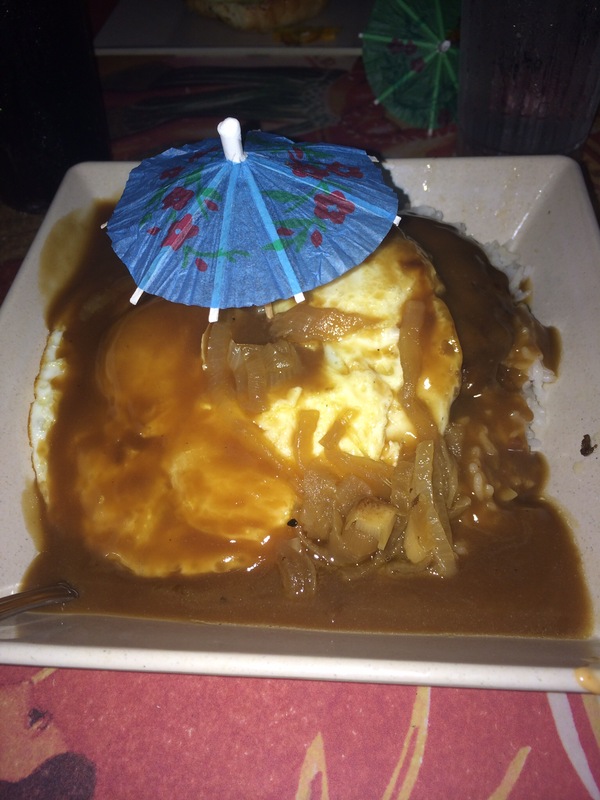 Loco Moco is white rice topped with a hamburger patty, brown gravy, and a fried egg with some onions on top. Very good and very filling! I also got my birthday cake here. It was Godzilla attacking the rainbow tower. 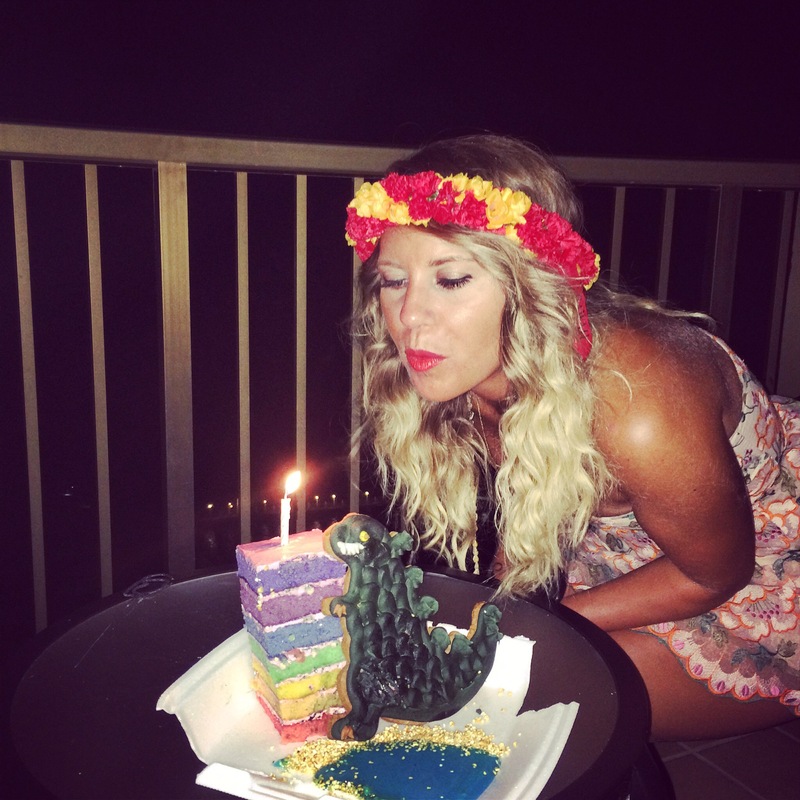 I thought it was cute and we took it to go so I could blow out my candle and make a wish in the privacy of my own balcony. The cake was very good. House without a Key this was a fancy restaurant that I found on TripAdvisor. It is located in the Halekulani hotel. They have beautiful outdoor seating right near the beach along with live music. On Tuesdays and Sundays they serve fancy BBQ Food and since we happened to visit on a Tuesday we were able to order BBQ. They give you delicious bread to start off with and it is baked on the premises. I ordered ribs and that came with macaroni salad and my husband ordered the fish of the day. We had a side of mashed potatoes(YUM!) The service was top notch, everyone from the waiter to our bus boy was super friendly. It was pretty fancy and high priced but I thought it was worth the experience. 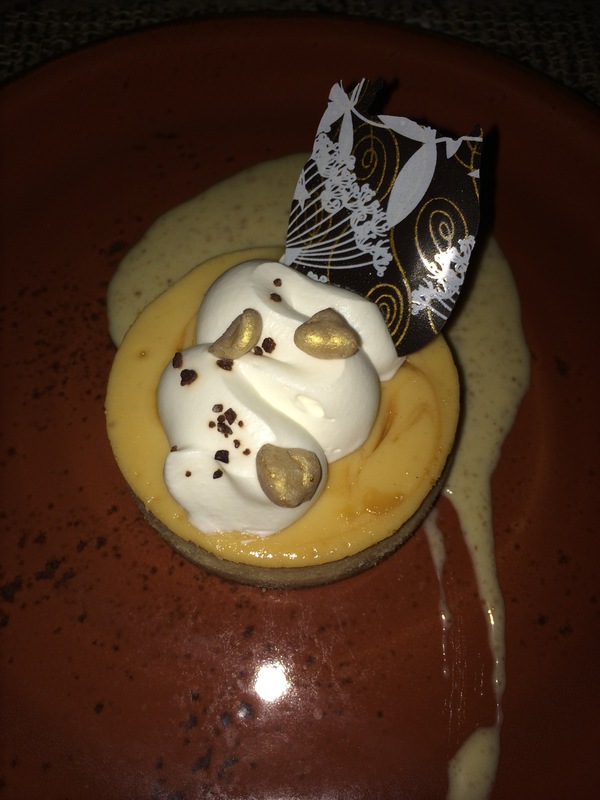 I ordered a macadamia nut cheesecake for dessert and that was delicious! Dukes Waikiki hula pie. Sooo good! We had lunch twice at Dukes Waikiki. It was right on Waiikiki beach. It was good for a quick bite and service was always great. The most memorable thing was the desert. 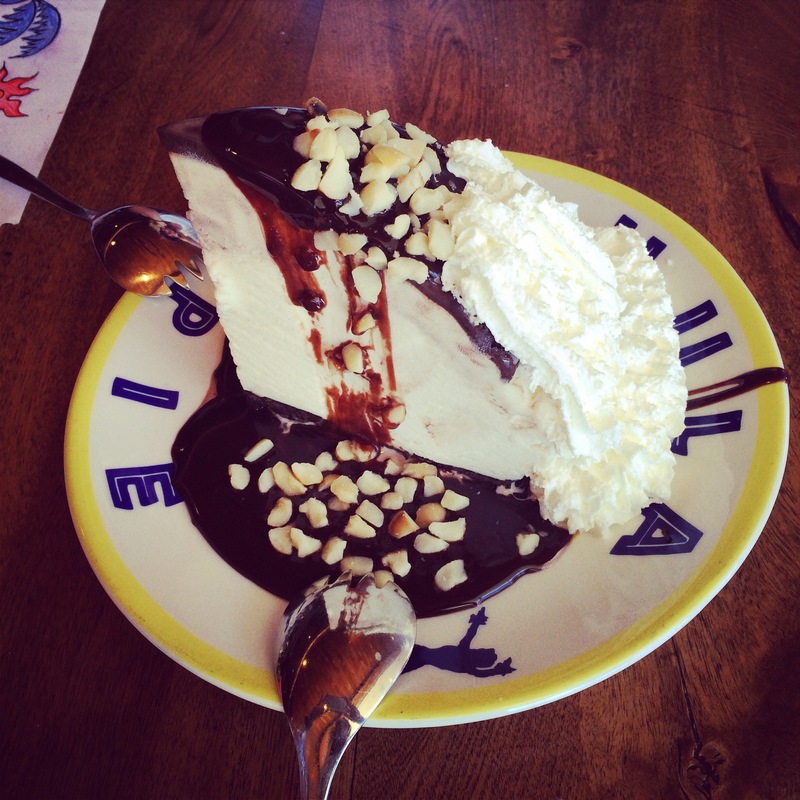 The hula pie consists of ice cream Oreo crust lots of macadamia nuts and fudge. (it was huge) The three of us dug right in and finished it! During our trip we saw a lot of Vietnamese restaurants. There was a ton of Asian restaurants all over the island. My husband has been wanting to try Pho for a while now. 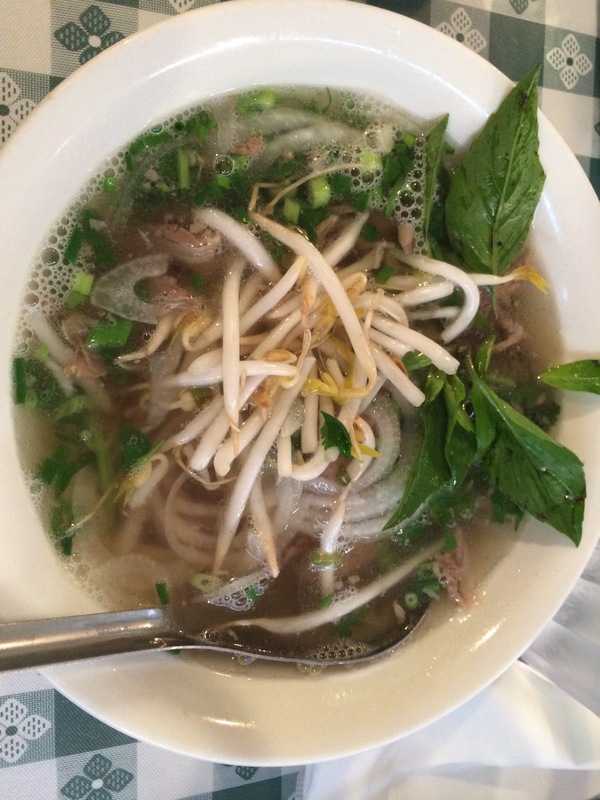 (since watching Phil talk about it on Modern Family)Pho is a Vietnamese broth soup with noodles, bean sprouts, scallions and meat. We ate in a restaurant called Pho Old Saignon. It was very tasty. There were several other restaurants we visited on our 12 day trip to Honolulu, HI. 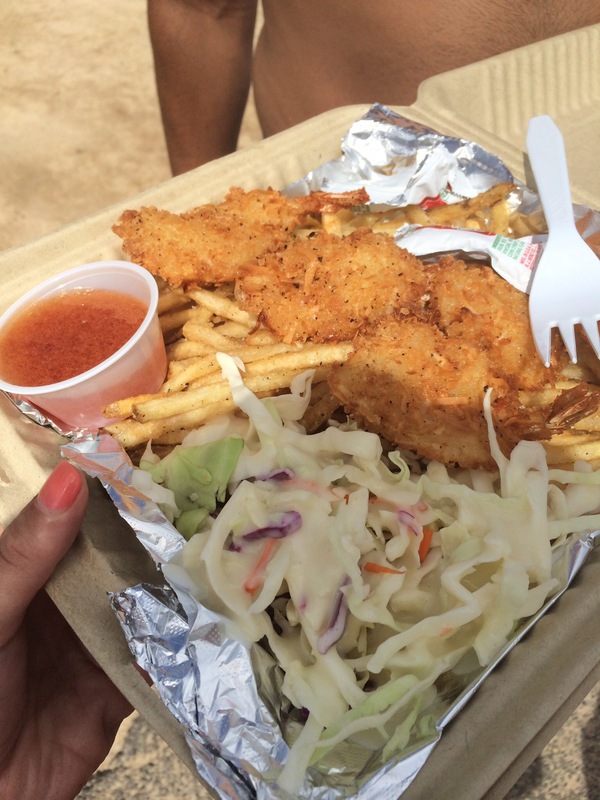 There were also food trucks right off the main road in Waikiki. They offered several food options such as Hawaiian(Loco Moco), Rotisserie Chicken, Ramen, Churro’s, (Alyssa’s fav) etc. They had benches where you can sit down and enjoy your food. 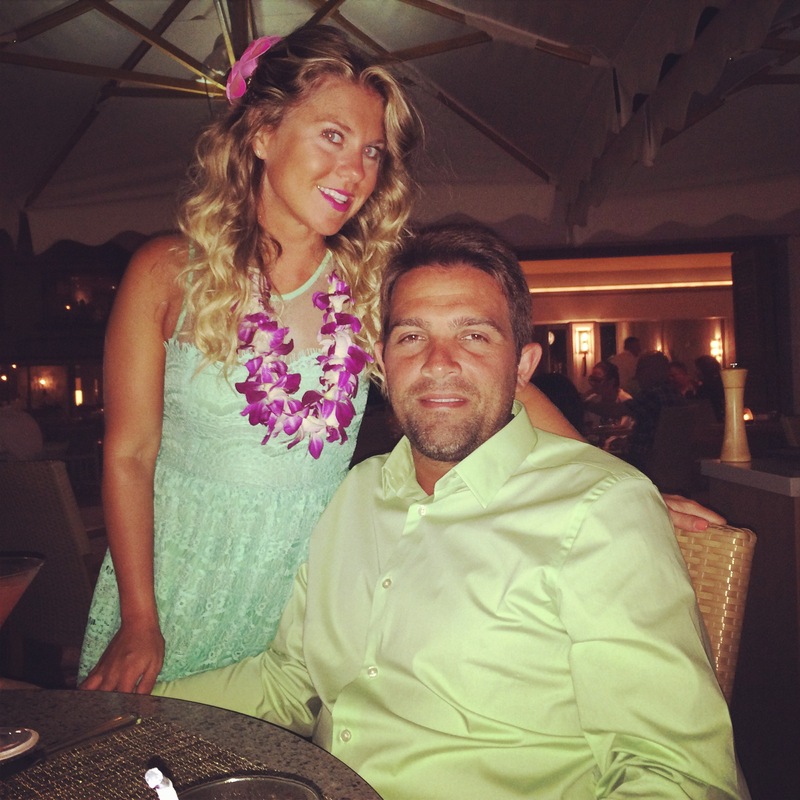 We dined at Fresco, an Italian restaurant located inside Hilton Waikiki Village. The food and service was great and it was a beautiful restaurant. Il Lupino is another Italian restaurant that I found on Opentable. They served fresh pasta and their bucatini all’amatriciana was very good! I made a comment on Opentable that we were celebrating my birthday and they had confetti on our table when we arrived. Also, when they brought out our dessert our very friendly waitress put a candle in it and she wished me a Happy Birthday several times. I just want to say I’m newbie to blogging and seriously savored you’re web site. More than likely I’m planning to bookmark your site . You definitely come with outstanding articles. Appreciate it for sharing your blog.